Anti-vaccers insist that vaccines are simply a scam by big companies who don’t mind poisoning children in the name of profit. They insist that vaccines are dangerous/unnecessary and doctors and health agencies only “push” them because those doctors and agencies have been bought off by the money-loving companies. As “evidence” of this, they often cite the fact that the number of vaccines that a child receives has increased over time, and they claim that the increase in vaccines is just so that the companies can increase their profits (it’s actually just to protect children against more diseases). This maze of conspiracies quickly falls apart, however, when you consider the fact that there are many vaccines that are not part of the routine schedule in most developed countries. Consider vaccines like yellow fever, cholera, and anthrax, for example. If anti-vaccers conspiracy theories were actually correct, then why aren’t those vaccines part of the routine schedule? As I’ll explain, there is no good answer to that question, and the fact that these vaccines aren’t routine is a serious problem for anti-vaccers. The anti-vaccine movement revolves around three fundamental premises, all of which are necessary for the anti-vaccine position. The first is simply that vaccines are unnecessary/cause more harm than good. There are many variations of this premise, and different anti-vaccers use different ones. For example, many claim that vaccines simply don’t work and improved sanitation actually caused the decline in disease rates (it didn’t). Other’s modify that to say that vaccines do work, but so does sanitation, therefore the vaccines are unnecessary. Still others argue that the vaccines work, but the diseases are just “harmless childhood illnesses” and the side effects of vaccines are worse than the diseases (they aren’t). Regardless of which variant is used, the core claim is always the same: vaccines aren’t necessary for reducing disease rates and ultimately do more harm than good. The second premise is that vaccines are sources of major profit for pharmaceutical companies (they actually aren’t) and they are really just about making money. Thus, according to anti-vaccers, “Big Pharma” doesn’t mind poisoning the population with harmful/unnecessary vaccines, because they only care about their bottom line. This leads to a problem though. If vaccines are really harmful/unnecessary, then why do doctors and every major health organization in the world recommend them, why do government regulatory bodies approve them, and why do so many scientific studies say that they are safe and effective? For anti-vaccers, the answer to all of these questions comes in the form of their third premise: a global conspiracy. According to anti-vaccers, pharmaceutical companies have bought off virtually all the world’s doctors and scientists, as well as government regulatory bodies (e.g., the FDA and CDC), and major health organizations (e.g., the WHO). This third premise lets anti-vaccers conveniently dismiss any evidence that disagrees with their position as simply being part of the conspiracy (it’s also an ad hoc fallacy). Once these three premises are combined, we have the anti-vaccer explanation for all vaccines. Take the MMR vaccine, for example. According to anti-vaccers, it is not necessary because measles rates were declining before the vaccine and it’s just a harmless childhood disease (premise 1). They also say that the vaccine is actually harmful and causes autism (it doesn’t) and all manner of other problems (still premise 1). Nevertheless, companies push the vaccines because they profit from it (premise 2), and they have paid off doctors/scientists/regulatory bodies/heath organizations to ignore its side effects and push the vaccine (premise 3). If that sounds like a reasonable argument to you, then please explain to me why vaccines like the vaccines for anthrax, yellow fever, and cholera aren’t part of the routine schedule. Why aren’t companies profiting from pushing those vaccines? The real reason is, of course, that those diseases aren’t common enough in industrialized countries for the vaccines to be necessary. Vaccines do have side effects, but serious side effects are rare, and for most vaccines (like MMR) the risk from not vaccinating is far greater than the risk of vaccinating. For vaccines like yellow fever, however, your chances of getting yellow fever in a country like the USA is ridiculously small. Therefore, unless you are traveling to a country where that risk is higher, it is better not to vaccinate. This is basic risk assessment, and it’s why the CDC and doctors don’t recommend the yellow fever vaccine as part of the routine schedule. Further, for things like cholera, the vaccine is generally often only effective for a short duration, and sanitation is actually a very effective means of controlling the disease. Those explanations don’t help anti-vaccers one bit, however. If companies can profit by tricking parents into thinking that their child needs to be vaccinated for measles, chicken pox, rubella, etc. then why can’t they also profit by tricking parents into thinking that their child needs to be vaccinated for anthrax, yellow fever, cholera, etc.? Similarly, if companies can buy off all of the worlds scientists, doctors, regulatory agencies, etc. to push unnecessary vaccines for other disease, then why can’t they do so for these diseases? Premise 3: Vaccine companies have bought off thousands of scientists, doctors, health agencies, and regulatory bodies to get them to push vaccines. Now, let’s consider the simple question, “why isn’t the cholera vaccine part of the routine schedule in most first-world countries?” If you say that it is because that vaccine is unnecessary or does more harm than good, then you have just rejected premise 1 and admitted that vaccines need to be beneficial and safe before they can be marketed. Similarly, if you say that it isn’t profitable, then you have admitted that vaccines aren’t worth vast sums of money, and premise 2 is gone. Finally, if you say that regulatory bodies, doctors, etc. won’t approve/recommend the vaccine, then you have rejected premise 3 and admitted that “Big Pharma” can’t pay off all the worlds’ scientists, doctors, government agencies, etc. Regardless of which option you take, you have to reject a fundamental anti-vaccer premise, at which point, the entire anti-vaccine position crumbles. Nevertheless, I anticipate anti-vaccers trying to get out of this by arguing that that there is something specific about these vaccines that make them unprofitable, impossible to market, etc., but good luck doing that without committing an ad hoc fallacy. As anti-vaccers love to point out, there are a lot of vaccines in the routine schedule, and they cover a pretty diverse range of diseases, so what common trait could vaccines like cholera, yellow fever, etc. possibly have that isn’t found in at least some vaccines in the current schedule? Let me give a few examples of the things you can’t use as a response (if you’re an anti-vaccer). You can’t say that it is because the diseases are rare in countries like the US, because that is an argument that anti-vaccers use against some vaccines in the current schedule. You can’t say that it is because they require boosters, because that is an argument that anti-vaccers use against some vaccines in the current schedule. You can’t say that the protective effects are short lived because that is an argument that anti-vaccers use against some vaccines in the current schedule. You can’t say that it is because there are serious side effects because that is an argument that anti-vaccers use against some vaccines in the current schedule. You can’t say that it is because the Big Pharma couldn’t market these particular vaccines, because anti-vaccers already argue that Big Pharma has managed to market dozens of unnecessary/dangerous vaccines, so there is no a priori reason why these vaccines should be any different. You can’t say that “Big Pharma” was stopped by doctors, health agencies, etc., because anti-vaccers claim that companies have already bought off all those people. Do you see the point? Any explanation that you offer for why these vaccines aren’t part of the routine schedule will inevitable be applicable to vaccines that are already in the schedule, thus invalidating the anti-vaccine position. In short, there is no explanation for this that is consistent with anti-vaccers’ ideology/conspiracy theories. If vaccines actually do more harm than good, and if they are actually all about money, and if doctors, scientists, government agencies, etc. 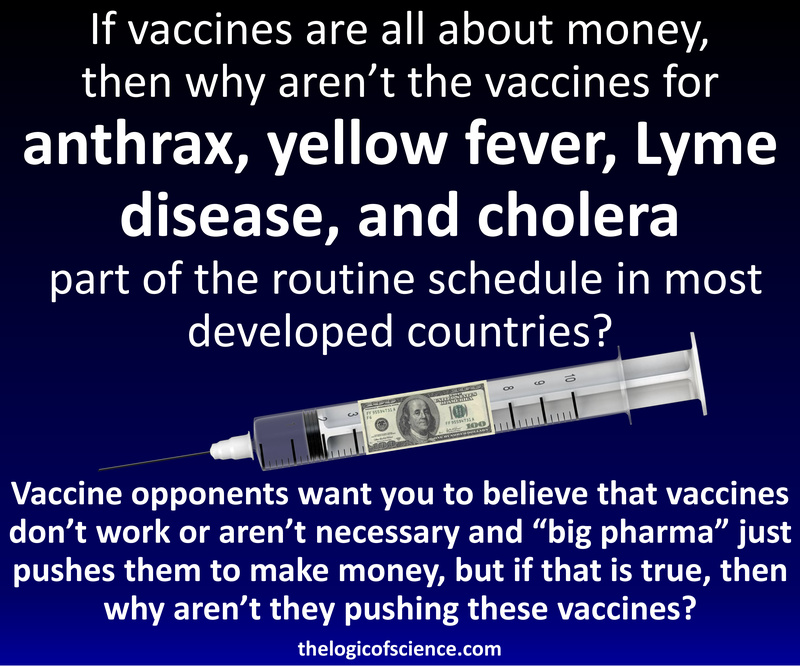 have actually all been bought off, then there is absolutely no reason why vaccines like the vaccines for anthrax, yellow fever, and cholera shouldn’t be part of the routine schedule. Therefore, the fact that they aren’t part of the routine schedule in most countries is an enormous problem for anti-vaccers. Their absence from the schedule indicates that the schedule is actually based on a scientific risk assessment of what children need in order to be protected, rather than simply being the result of pharmaceutical companies trying to fill children with as many vaccines as possible so that they can line their pockets with profits. This entry was posted in Vaccines/Alternative Medicine and tagged ad hoc fallacies, anti vaccine arguments, Vaccines. Bookmark the permalink. 5 Responses to If vaccines are a scam to make money, why don’t we routinely vaccinate for diseases like cholera? Thank you for another good rebuttal of one of the more popular antivaccine tropes. But please allow me to elaborate further on one particular point you addressed, in order to grind it down further to the fairy dust it is. *: This actually says quite a lot about how antivaxxers see other people. Apparently, you really can’t trust anyone, nor what anyone says or does. And everyone is wiling to harm other people for just a bit of money. I almost feel sorry for them, because these are the hallmarks of the truly paranoid… Or as a more sinister interpretation, those antivaxxers would be willing to hurt children on a daily basis for a few thousand dollars a year… Either way, they’re the ones looking bad. Couldn’t we also point anti-vaxxers to the vaccination rate among medical staff’s children? Surely they are not vaccinated, since their parents know all too well the danger the represent. I’m a pediatrician and everyone in my household (myself, spouse, teens) is vaccinated, yet I’ve been accused of lying about that fact. People have such fixed notions that they just can’t believe simple facts. It is a conspiracy. I just hide my shill bucks, that’s why I’m not living the high life. If Big Pharma was behind vaccines, they’re looking at a poor way to profit. The medicine needed to treat them is far more expensive and even if the victims of said diseases die, they’ve made their money. Big Pharma would be pushing to not vaccinate, though I suppose an anti-vaxxer would argue that they’ll just make more money during the person’s longer life…but wait, if vaccines are poison that falls apart. Any child I have is being vaccinated on schedule, because of evidence based medicine.